Over the past few months, IFF has identified violations of Net Neutrality through blocking of website access. In light of these current threats to net neutrality, it has taken the step to activate the SaveTheInternet.in website. Back in 2016, the principles of Net Neutrality were established in India when the Telecommunications Regulatory Authority of India prohibited Discriminatory Tariffs for Data Services. This effectively prohibited pricing and technical discrimination as offered Facebook’s Free Basics services. 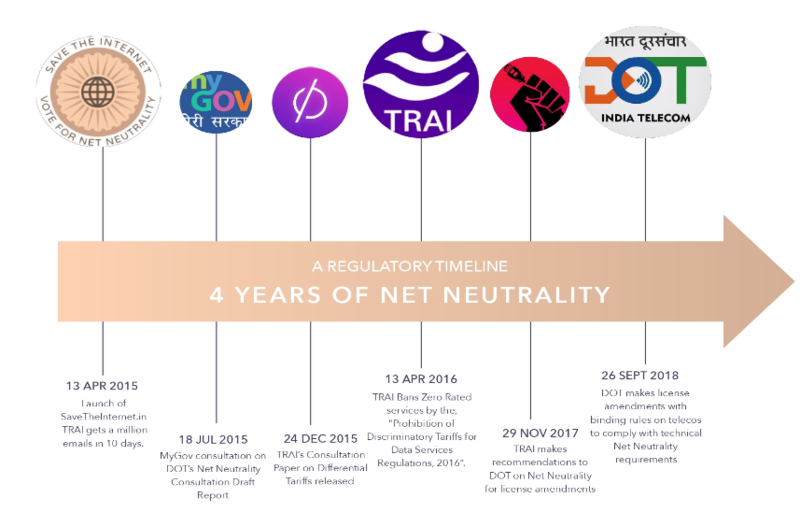 In 2018, TRAI further solidified net neutrality in its recommendations which the Department of Telecommunications adopted to make license amendments. However, there have been lasting concerns over the years that largely deal with lack of enforcement of these Rules. This brings us to the current day scenario where we have been witnessing rigorous website blocking by TSP/ISP’s with no legal justification. We have been updating you in our previous posts of these rampant occurrences. "The Present and Future of Net Neutrality in India"
The Centre for Communication Governance at NLU Delhi and the Internet Freedom Foundation organised an engaging discussion on “The Present and Future of Net Neutrality” this on March 14, 2019 (Thursday) at the India International Centre, Annexe. The reason behind organising such a gathering was to examine Net Neutrality's existing regulations and concerns but more importantly identify the necessary steps forward to protect the spirit and intent of net neutrality. The panellists comprised of experts from government, academia, civil society organisations and industry. Additionally, we have created a report summarising significant aspects of the discussion (Read here for more). As we have explained, over the past few months, the Internet Freedom Foundation has focussed its efforts on identifying the violations of Net Neutrality through blocking of website access. It is in light of these current threats to net neutrality, it has taken the step to activate the SaveTheInternet.in website on March 18, 2019 at 8:00 AM. The website has been designed to move beyond email support for net neutrality to active petitioning. With a direct "Take Action Petition" button, it provides individuals and organisations with the opportunity to show support to list of joint demands sent to the relevant government offices. We continue to make it possible for you to submit reports of any net neutrality violations to us. However, the buck does not stop there. We at IFF will continue to monitor violations as we have and to the best of our abilities will ensure the spirit of Net Neutrality is maintained in India. Through this data we will be armed to take advocacy actions, make formal complaints and ensure TRAI and DOT enforce the necessary enforcement mechanisms. All for one and one for all! Support IFF in the fight for Net Neutrality. A public interest community project | Powered by IFF.